Orange Guard Ant and Insect Killer -Get rid of ants without harming your pets and family! Orange Guard is guaranteed to provide safe, effective control against a broad range of insects including ants, fire ants, roaches, fleas, silverfish, aphids, spider mites, leaf hoppers, locusts, weevils, scale insects, and other insect pests. Orange Guard contains d-Limonene (orange peel extract), which is steam distilled orange peel oil. Kills on contact and smells great too! Available in 32 oz. spray container or 128 oz. (gallon) container. How does Orange Guard Kill insects? The active ingredient d-Limonene (orange peel extract) destroys the wax coating of the insect’s respiratory system. When applied directly, the insect suffocates. In a recent study, Orange Guard reduced cockroach populations more effectively than Dursban, the toxic ingredient in Raid. How does Orange Guard repel insects? The citrus fragrance of d-Limonene acts as a repellent. May I spray Orange Guard on my kitchen counters? Yes, you may safely spray your counters, and there is no need to evacuate the house. Easy clean up with damp cloth or sponge. Remember to read and follow directions on the label. Can Orange Guard stop ants from crawling up my tree? Saturate the base of the tree including the earth around it, check in a couple of days to see if they have returned. If they have, saturate again and try to follow the trail to find the source. Then saturate the source. There are large ants in my yard. They don’t come in my house or cause any problem in the garden. Should I exterminate them? No, these ants are leaf cutters that are just doing their job cleaning your yard. They are endangered by the evil Argentinean Ants which are displacing them. When we lose our leaf cutting ants, we also lose our horn toads which eat them. Horn toads do not eat Argentine ants because they are too small. What can I do about ants in my trash can? Orange Guard is a contact killer, so spray the visible ants until wet. Spray inside the can on stream setting, spraying the corners or edges and letting the Orange Guard run to the bottom. Also follow the ant trail to the source, or cracks and crevices, and saturate. What are the inert ingredients in Orange Guard? Are they safe? All ingredients in Orange Guard meet the food grade G.R.A.S. (generally recognized as safe) standard set by the FDA. Orange Guard is water based, with a natural emulsifier, which is proprietary. May I spray my carpeting? Yes, as a prewash spray for fleas. Steam clean carpet after treatment. How safe is Orange Guard? Orange Guard is a water-based insecticide. All ingredients in Orange Guard meet the G.R.A.S. (generally recognized as safe) standard set by FDA. d-Limonene is approved by the FDA as a food additive, and is found in products such as fruit cakes, cleaners, degreasers, air fresheners and pet shampoos. Orange Guard is 100% biodegradable and water-soluble. Orange Guard is listed by the Organic Materials Review Institute. Is there a complete list of insects that Orange Guard’s active ingredient controls? No. The EPA calls d-Limonene a broad-based insecticide. What affects the duration of Orange Guard’s repelling effect? Exposure shortens the life of the repellency. Orange Guard repels best in cracks and crevices and works when the surface is absorbent and saturated. Try to find the source of infestation and re-apply Orange Guard. Are there any temperature restrictions for storing and using Orange Guard? Orange Guard can be stored at normal room temperatures and can be applied at any temperature. Do not boil or freeze. Orange Guard is entirely water-soluble. Any marks left on cement should rinse clean with water. 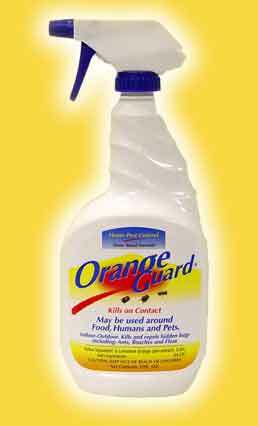 Orange Guard is not yet labeled for spraying pets. You may spray pet bedding to control fleas.